A general blog about English, Scottish and European football. Probably rated as they highlight of the weekends Premier League games as well as adding the spice of a London derby, this match had all of the makings for an enthralling event. Interestingly AVB decided to play with 2 up front in Adebayor and Defoe, a tactic he has not readily used so far this season. Meanwhile Walcott was afforded a place in the starting line, probably as Wenger tried to match Spurs like for like for pace. If you see the highlights on MOTD, I do hope that Walcott was sporting a tash for Movember and not just trying out a new style. There were a few strong tackles in the opening moments of the match, neither side really taking hold of the ball but Tottenham did think they took the lead for a brief moment on 8 minutes when Galas found the net but was deemed, rightly so, to be offside. Arsenal should have taken heed from the early scare as it only took Spurs 60 seconds to make it 1-0 to the away side. Defoe beat the offside trap and latched onto a long ball over the top of the Arsenal defense. 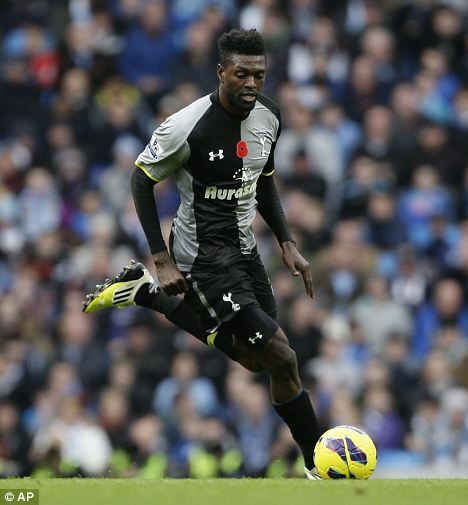 The keeper did well do deflect the shot from the in-form striker but could do nothing as Adebayor slotted home. Lennon found himself at the edge of the box on the 12th minute and was unlucky…just shooting wide of the far post, the Gunners looked anything but organised at the back, being pulled each and every way by the Spurs wingers Bale and Lennon. Arsenal then began to pull their way back into the match and the advantage swung back into the home sides favour when Adebayor was given a straight red card for a reckless challenge on the half way line on Cazorla. The ref gave himself plenty of time to make his decision but no one could dispute why he sent the ex-Arsenal and Man City player off…a silly needless tackle in a match they were leading. AVB made two changes at half-time to try to change his sides fortunes; Dawson and Dempsey on for Naughton and Walker. Perhaps a bit more experience at the back and a different, stronger threat up front. Tottenham certainly came out fighting, Arsenal seemingly slowing everything down to control the match, in danger of being complacent at times, but doing just enough to cut out Spurs attacks at the final moment. Despite this, Arsenal did finally increase their lead on 59 minutes; Walcott laid the ball in front of Podolski who was sprinting down the left-wing who in turn crossed a delightful low ball across the face of the goal to meet the unmarked Cazorla at the far post. 4-1 Arsenal and pretty much tying up the 3 points. Bale did give the away fans something to cheer about on 70 minutes, the Arsenal defence once again going to sleep just as they did against Fulham. The space just opened up in front of the Welsh winger and he needed no more of an invitation to put his skates on and then drive a low hard shot into the Arsenal net. 4-2 and a possible come-back? Bale, 2 minutes later was unlucky to miss the target from out wide and make it 4-3, but probably should have passed the ball to Defoe who was lurking in the box. A chance that could have changed the complexion of the game. That was in fact the last threat to the Gunners goal and to add insult to injury Walcott, who was put up front as striker when Giroud was taken off, slotted home on the 91st minute to end the match 5-2. A comfortable win in the end for Arsenal, but I wonder what the result would have been if Spurs had managed to keep 11 players on the pitch? Adebayor certainly did his old club a favour!